A simple mixture of shredded cheese, mayonnaise, and pimentos; a tradition southern American spread. 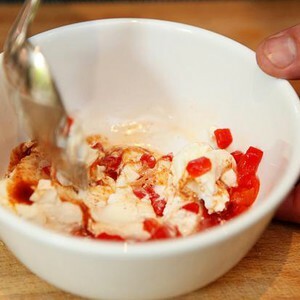 Now a creamy concotion of pimento peppers, mayonnaise and shredded cheese, this long-popular Southern spread began as a mixture of canned pimentos and cream cheese. It has evolved into both a staple stocked in the standard Southern pantry and a gourmet condiment worked into trendy "modern Southern" restaurants. Atlanta-based Watershed presents a "pimento cheese pecan log with benne wafers and pepper jelly" (drool) while Homegrown (which has served Mr. President himself) boasts a homemade grilled pimento cheese sandwich. Variations on the classic pimento cheese recipe are common. While some add onions or jalapenos to kick up the flavor, others believe the magic lies in the cheese selection. Though its ingredients may be simple, pimento cheese is here to stay. Best of all? We at PeachDish want for you to recreate the deliciousness of this classic in your own home! In our Tortilla Chips with Pimento Belle Chevre, we get creative with Belle Chevre goat cheese out of Elkmont, Alabama. This recipe allows you to make your own pimento cheese from scratch using the simple ingredients of Mississippi's D'evereux hot sauce, lime, and diced pimento. Nibble on this can't-live-without appetizer while you cook your next PeachDish meal. Hooked on testing pimento cheese out in even more recipes? We go crazy for this take on the spread worked into our Smoked Salmon Quesadilla with Lime-Cilantro Crema & Black Bean-Cherry Tomato Salsa.